No less than 6 members of the ERA NOBO party have decided to leave the party ranks on the eve of the official registration of the party to participate in the March 2019 elections for the Island Council. Photo: Live99FM. Kralendijk – The continued existence of the new political party ERA NOBO, which on January 22, 2019 proudly presented itself to the media, seems to be in big trouble. The party, led by Eric Soleana, saw no fewer than 6 prominent party members resign yesterday. Since the presentation of the list a good week ago, a lot of irritation arose about the leadership of Soleana, which was labeled by some party members as ‘dictatorial’. In addition, the party members were of the opinion Soleana did not make good on earlier promises; a bad sign before the party even participate in its first election. The massive departure of the party members raises questions about the participation of the party in the upcoming elections for the Island Council, especially since tomorrow will be the last day for the party to present their list to election authorities. 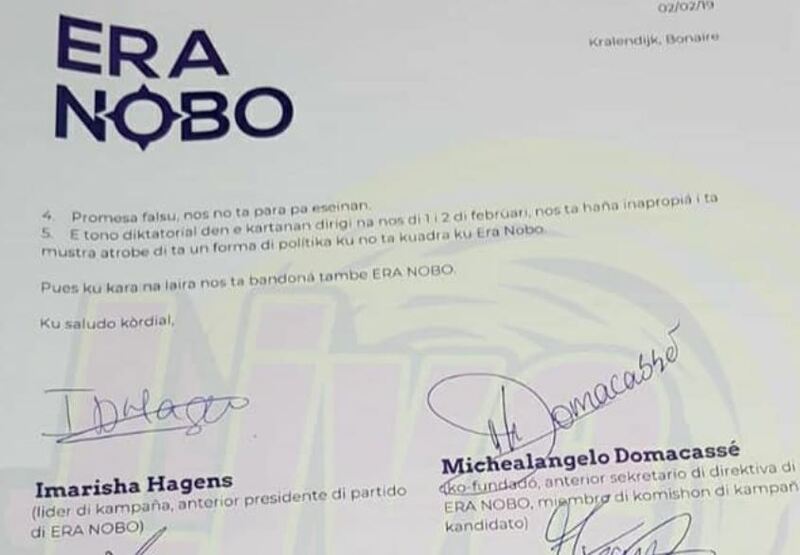 The letter of dismissal, interestingly enough sent out on the letterhead of ERA NOBO, was signed by Imarisha Hagens, Edwina Molina, Mirchonella Winklaar, Michaelangelo Domacassé, Jay Frans and Ferdinand Bernabela. Party leader Soleana so far did not seem to be impressed by the fact that most of his party members are defecting. According to Soleana, the resignation of the group is nothing but a “preconceived action” of people who want to harm the party. “I advise everyone to stay far from Edwina Molina and her daughter (Imarisha Hagens, ed. ), because they are a bunch of manipulators” said Soleana in statements made to the media. According to Soliana, ERA NOBO will now enter the elections ‘stronger than ever’. Soleana and ERA NOBO are running on an agenda of opposition to the current course of the island, which they consider being too much dominated by the Netherlands.